Some fragrance-less carnation cultivars are often used as boutonnieres for men. Carnations require well-drained, neutral to slightly alkaline soil, and full sun. Numerous cultivars have been selected for garden planting. Typical examples include 'Gina Porto', 'Helen', 'Laced Romeo', and 'Red Rocket'. Colombia is the largest carnation producer in the world. For the most part, carnations express love, fascination, and distinction, though there are many variations dependent on colour. Along with the red rose, the red carnation can be used as a symbol of socialism and the labour movement, and historically has often been used in demonstrations on International Workers' Day (May Day). In Portugal, bright red carnations represent the 1974 coup d'etat that ended the Estado Novo regime. According to a Christian legend, carnations first appeared on Earth as Jesus carried the Cross. The Virgin Mary shed tears at Jesus' plight, and carnations sprang up from where her tears fell. Thus the pink carnation became the symbol of a mother's undying love. 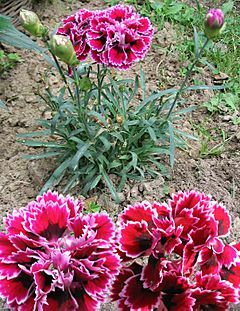 The formal name for carnation, dianthus, comes from Greek for "heavenly flower", or the flower of Jove. Carnations are often worn on special occasions, especially Mother's Day and weddings. In 1907, Anna Jarvis chose a carnation as the emblem of Mother's Day because it was her mother's favourite flower. This tradition is now observed in the United States and Canada on the second Sunday in May. Ann Jarvis chose the white carnation because she wanted to represent the purity of a mother's love. This meaning has evolved over time, and now a red carnation may be worn if one's mother is alive, and a white one if she has died. In Korea, carnations express admiration, love and gratitude. Red and pink carnations are worn on Parents Day (Korea does not separate Mother's Day or Father's Day, but has Parents Day on 8 May). Sometimes, parents wear a corsage of carnation(s) on their left chest on Parents Day. Carnations are also worn on Teachers Day (15 May). Red carnations are worn on May Day as a symbol of socialism and the labour movement in some countries, such as Austria, Italy, and successor countries of the former Yugoslavia. The red carnation is also the symbol of the Portuguese Carnation Revolution. Green carnations are for St. Patrick's Day and were famously worn by the Irish writer Oscar Wilde. The green carnation thence became a symbol of homosexuality in the early 20th century, especially through the book The Green Carnation and Noël Coward's song, "We All Wear a Green Carnation" in his operetta, Bitter Sweet. In Poland, in times of People's Republic of Poland, carnations were traditionally given to women on the widely celebrated Women's Day, together with commodities that were difficult to obtain due to the economic hardships faced by the country's communist system, such as tights, towels, soap and coffee. Carnations do not naturally produce the pigment delphinidin, thus a blue carnation cannot occur by natural selection or be created by traditional plant breeding. It shares this characteristic with other widely sold flowers like roses, lilies, tulips, chrysanthemums and gerberas. Around 1996 a company, Florigene, used genetic engineering to extract certain genes from petunia and snapdragon flowers to produce a blue-mauve carnation, which was commercialized as Moondust. In 1998 a violet carnation called Moonshadow was commercialized. As of 2004 three additional blue-violet/purple varieties have been commercialized. Carnation Facts for Kids. Kiddle Encyclopedia.